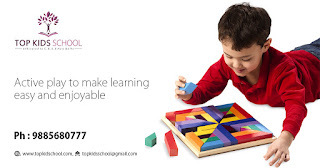 Top Kids School is one of the Best Preschools in Guntur. Preschool (or) Nursery School is a crucial time, replete with opportunities to initiate the love for learning in young kids. At Top Kids School, the dedicated preschool section, housed in a quiet setting away from city humdrum at SVN Colony, has been lovingly transforming tiny tots into lifelong learners, since 1997.
searching for famous schools in Guntur, your search ends here. Welcome to the online home of Top Kids School, a quality institution that offers a professional and global learning environment with CBSE education (affiliation no: 130205). Having a glorious history dating back to its establishment in 1997, it is anchored in an established, well developed and pleasantly soothing expanse of 2.6 acres with most modern features and integrated facilities.Topping the list of central syllabus schools in Guntur, Top Kids School enables a conducive, nurturing environment in which children are inspired to pursue their inherent potential. In line with its philosophy, the top rated school in Guntur believes in a student centred approach to instruction, following an enquiry based inter disciplinary curriculum, team work, motivation and collaboration of teachers, staff and parents. In essence, catering for children with a diverse range of learning needs. What’s more, the school has a very strong alumni and the past students are faring well in their lives after completing their education at Top Kids. Many of them are currently undergoing their higher education in premier medical and engineering colleges of India such as IIT Mumbai, BITS, Guntur Medical College, Gandhi Medical College, CTP and so on. Therefore, in order to help you in making an informed decision, you are invited to experience the Top Kids School difference…in person. Top Kids School is one of the Best CBSE Schools in Guntur. Since it Inception in 1997, Top Kids School, the finest among Private Schools in Guntur City, has been encouraging individuality and empowering students to believe in their Personal Power. A part From Appilication Based Education to reduce the stress on child's learning process, emphasis is laid on healthy and positive encouragement. This student centered methodology provides the needed platform for every child to blossom from within.